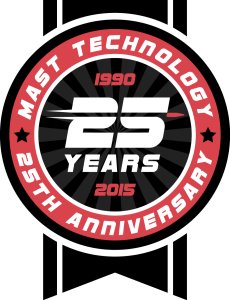 March 2015 Press Release | MAST TECHNOLOGY INC.
Twenty-five years ago, MAST Technology was launched by Jim Bell, the company’s founder, to fulfill the need for 9mm SMAW spotter tracer ammunition for the US Navy. Today, MAST is guided by Jim’s son, Jay Bell, CEO and majority shareholder, using the values and principles established by Jim in Las Vegas in July of 1990. The plan was to re-create Brass Extrusion Labs Limited (B.E.L.L.) sold in 1988. Jim’s heart longed for the small, under twenty-person operation to pursue his passions in the gun and ammunition world. Since 1990, MAST experienced a surge in positive customer response, helpful and useful input, and flourished beyond what Jim imagined long ago. We are a valued supplier to all branches of the DOD with our 40mm M781s, M81 Igniters, 20mm ammunition, and much more. Even with the transition of ownership from Jim to his sons, MAST Technology continues to thrive and exceed expectations of our clients on a daily basis. As any good company knows, remaining stagnant and having a mindset of being “good enough” is no plan for success. At MAST, we are continually striving to improve our processes and quality, and surpass our own expectations. A World-Class company isn’t born overnight; it is forged in the hands of committed, passionate, brilliant individuals who share the same goals and direction. Getting to this point wasn’t always easy. In fact, it was quite tough at times, but we are resilient and determined, to say the least. At MAST Technology, when a goal is conceived, it is planned and achieved. In celebration of change and moving forward, we are revealing our updated logo; a more appealing design to represent our momentum in the global defense and shooting industries. We believe this redesign accurately portrays the strength, innovation, and ideals that MAST Technology holds at its core. May the next twenty-five years infuse us with as much knowledge and prosperity as the last.